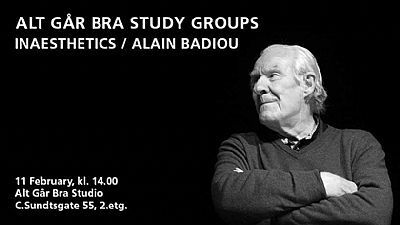 On Sunday the 11th of February at 2pm, we will meet to continue discussing Alain Badiou's book Inaesthetics. If you would like to join us, please read in advance the first chapter of Inaesthetics. Reading chapter 10 of Jacques Ranciere's book Dissensus could be helpful to follow the discussions. The study groups are open to all and participants can always join in even if they had not attended previous sessions. Alt Går Bra started holding study groups in connection with its Tout Va Bien series of talks in Bergen. Organized by Alt Går Bra at Bergen Kunsthall since 2015, the series researches the intersections between art and politics with invited guests including Chantal Mouffe, Thomas Hirschhorn, Jacques Rancière, and Chto delat among others.